Can You Drink a Protein Shake When You Don't Work Out? The U.S. protein powder market reached $4.23 billion in 2018, and it's growing from one year to the next. From elite athletes to dieters and gymgoers, most people take protein supplements to build muscle and strength, reach peak performance or enjoy good health. But what about using protein powder on off days? Does it help you or is it safe overall? Drinking protein shakes on your rest days can help you preserve lean mass, recover faster from exercise and ignite fat loss. It all comes down to your goals and overall diet. Most gym enthusiasts drink protein shakes before and after training to recover faster and ignite muscle growth. Some use it as a meal replacement or weight loss aid. And they're right — protein supplements do improve exercise performance and can help you lean out. According to a 2017 study published in the International Journal of Medical Sciences, whey protein enhances athletic performance, stimulates muscle growth and improves body composition, also known as muscle-to-fat ratio. Elite track runners who drank protein shakes experienced an increase in muscle mass, better physiological adaptation to training and faster recovery compared to the placebo group. In a 2014 study published in Medicine & Science in Sports & Exercise, mice fed with whey protein were able to exercise for a longer period of time. Furthermore, their grip strength increased and their body composition improved. Depending on your needs and preferences, you can drink a gym shake before or after exercise or anytime throughout the day. Read more: Does Drinking a Protein Shake After Exercise Help You Lose Weight? Pre- versus post-workout protein intake has similar effects on physical performance, according to a 2017 study published in the journal PeerJ. These findings indicate that consuming protein immediately after a workout to maximize hypertrophy and muscle repair isn't as important as it was once thought. The existence of a post-exercise window is subject to debate. So, given the relationship between protein and exercise performance, does it make sense to use protein powder on off days? Perhaps. Harvard Medical School notes that consuming 0.8 grams of protein per kilogram of body weight — which is the recommended daily intake — may not be enough, especially for active individuals. Experts recommend a high protein intake to preserve lean muscle and speed up fat loss while on a diet. This nutrient promotes satiety, increases metabolism and suppresses appetite. When combined with an active lifestyle and regular exercise, its benefits are even greater. Read more: What Are the Benefits of Protein Powder for Women? If you want to slim down or need more protein in your diet, feel free to have a gym shake on your off training days. For example, if you skip breakfast or have a business meeting, drinking a protein shake can replace a meal and provide you with the energy needed to function optimally. It's also a convenient way to nourish your body when traveling or whenever you're too busy to eat real food. However, these beverages cannot replace food; their role is to supplement your diet. Except for water, all foods and beverages provide calories. Protein shakes are no exception. If you go overboard, you may end up gaining weight — especially if you have a sedentary lifestyle. Plus, the effects of protein shakes without exercise are negligible. These supplements work best when used as part of a training program since they fuel your muscles into growth and increase fat burning. It's thought that too much protein can affect kidney function. The research is mixed. According to a 2017 review published in Annual Review of Nutrition, white meat and dairy protein are unlikely to increase the risk of chronic kidney disease. Daily consumption of red meat, by contrast, may contribute to this condition. So, protein source matters. Whey protein, for example, is based on dairy, so it's healthier than deli meats, smoked red meats and other processed foods with a high protein content. Plus, you can always opt for hemp, pea, rice or oat protein shakes, which contain no animal-derived ingredients. Keep in mind that not all protein shakes are created equal. Many formulas are loaded with sugar, artificial sweeteners, synthetic flavors and other chemicals. These ingredients can wreak havoc on your health and keep you from reaching your fitness and weight-loss goals. Look for protein shakes with organic or natural ingredients. A quality formula will contain little or no carbs and no added sugar. Journal of the International Society of Sports Nutrition: Nutrient Timing Revisited: Is There a Post-Exercise Anabolic Window? Harvard Medical School: How Much Protein Do You Need Every Day? Mayo Clinic: I'm Trying to Lose Weight. 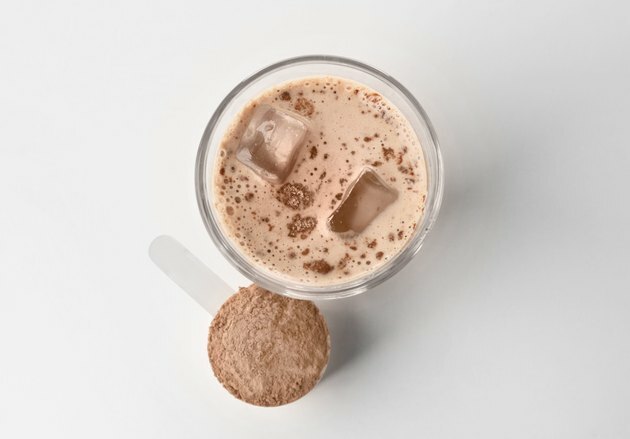 Could Protein Shakes Help? How Much Protein Powder Should I Drink? Is a Protein Drink Good After Cardio? What Are the Benefits of a Protein Shake? When Is the Best Time to Take Creatine & Protein Together?